One day, the plan is to open our own winery! 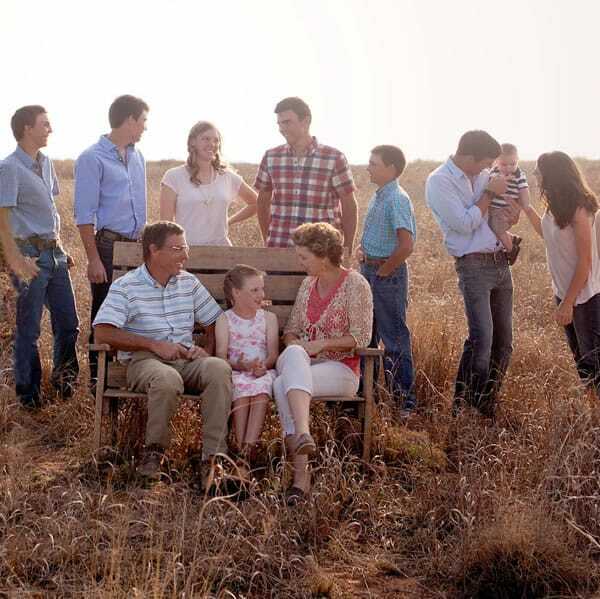 For now we are content to make wine with our own grapes at home – hobby wine makers, that’s us! Making wine was the planned activity for Monday – to glean the Roussanne grapes which were left after harvest and begin the wine making process. The first and last plants of each row are always left without being harvested because they are so close to the end post. The Pellenc grape harvester is turned on and off over these plants which means even after harvest, we still have some grapes to eat or to make wine with! We were expecting enough grapes to fill a few 5 gallon buckets but we exceeded our expectations – we filled nineteen 5 gallon buckets! Just like last year, John’s brother Joe has been visiting and was here to help with the hand harvesting and wine making. But, unlike last year, we did not use feet to do the crushing! 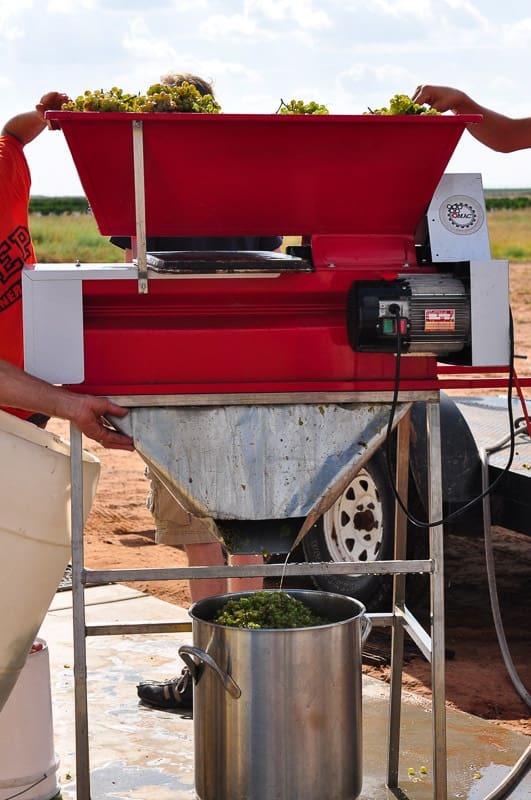 This year, we purchased a crusher destemmer rather than use feet (which was fun – for those who remember “I love Lucy”, think Lucy and Ethel stomping grapes ;)) or borrow our grape consultant’s crusher. 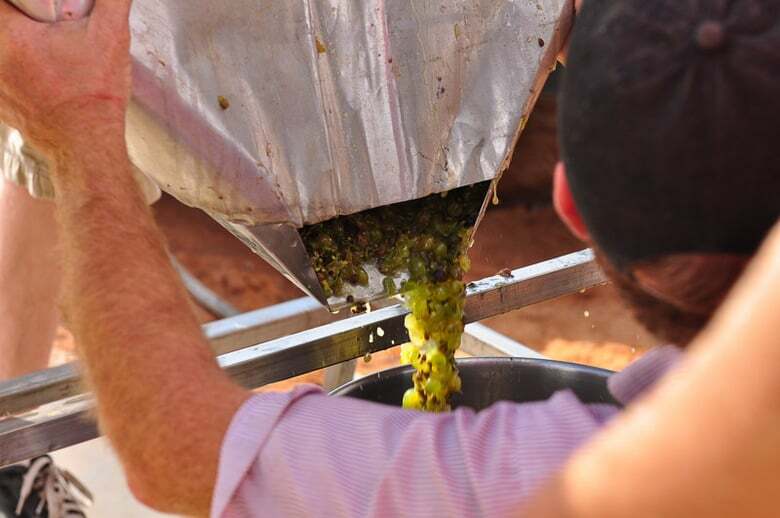 The Roussanne grapes (or whatever variety you are working with) are poured into the top of the crusher destemmer – the red hopper. 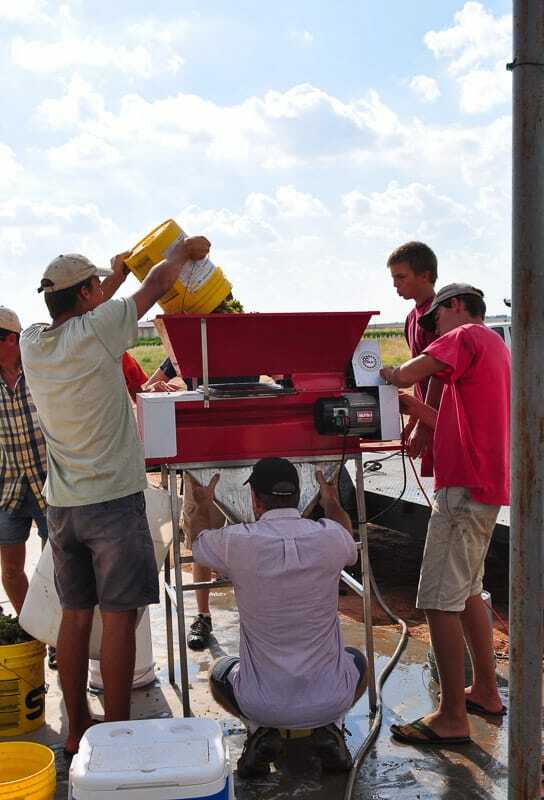 The motor works its magic and crushes the grapes separating the majority of the stems (rakuses) from the grapes and spits out the juice and crushed grapes. 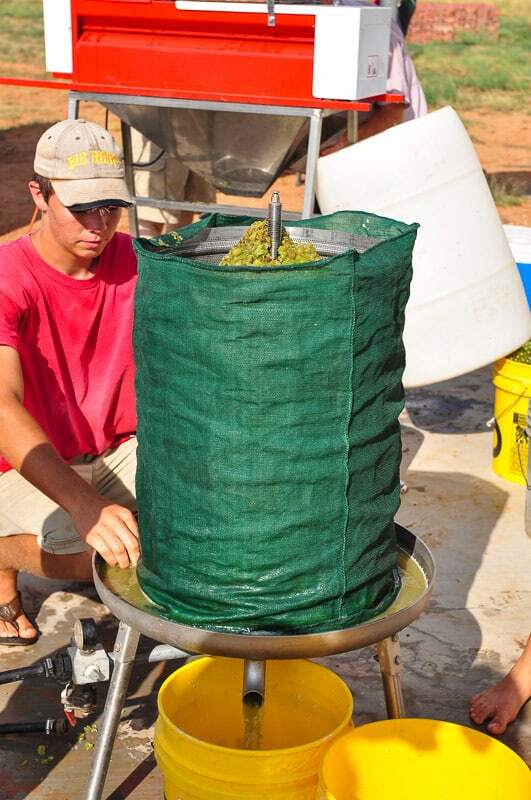 Once the grapes were crushed and destemmed, we used our bladder press to press the remaining juice from the rakuses. 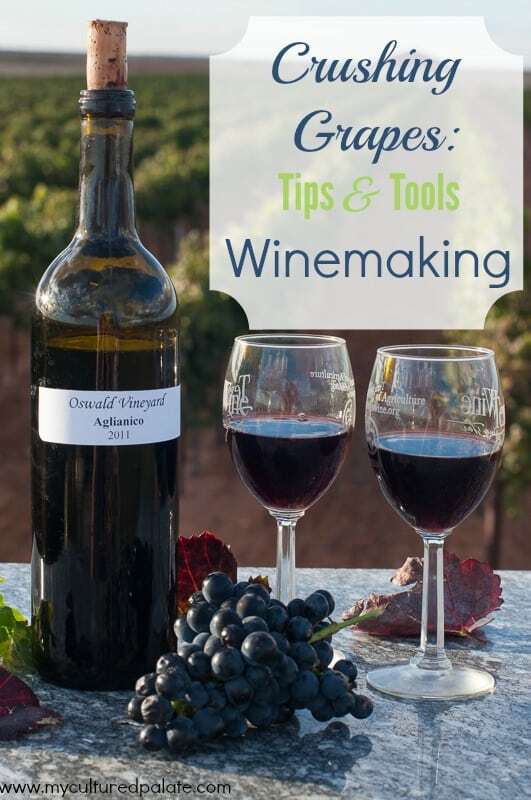 The crushed and destemmed grapes are poured in the top and water is turned on to fill the bladder which is in the center of the grapes. The pressure rises pressing the grapes between the sides of the press and the bladder. The juice runs out the bottom where we catch it in a bucket. 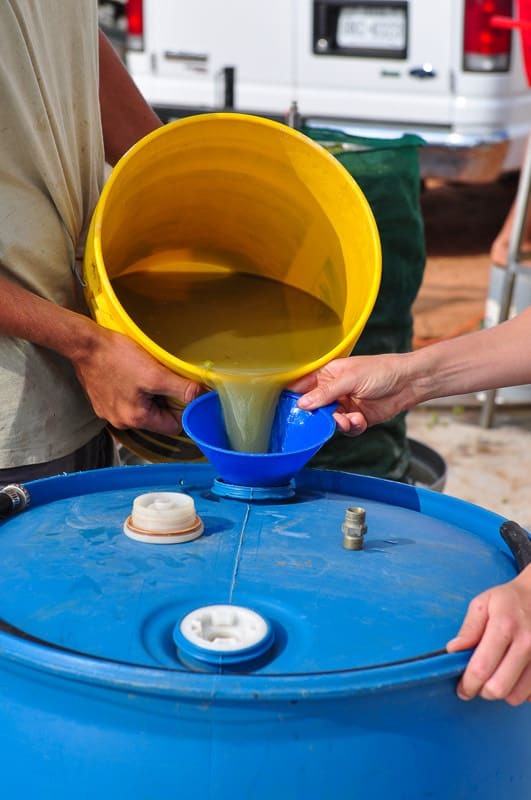 After being caught into a 5 gallon bucket, the juice is then poured into a 55 gallon drum. Ending up with 35 gallons of Roussanne grape juice was a nice surprise from what we had originally estimated. But, it also posed a problem. 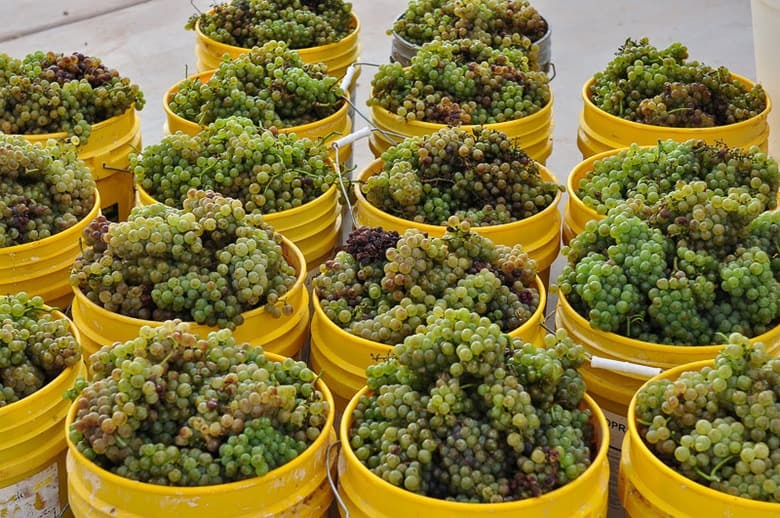 Roussanne, like most white wines, needs to be fermented cold – refrigerated – to maintain the flavor and grape characteristics. To put it simply, we did not have refrigerator space for all that juice! Enter Kim McPherson of McPherson Cellars. John made a quick call to Kim who very kindly allowed us to pour our juice into one of his tanks. He will take it from here and carry the juice into wine! I am looking forward to some outstanding Roussanne wine! We also have 1/3 acre of Muscato Giallo (another white grape) which we planted to use in our own winery someday. We hand harvested it Tuesday – we had room for that juice in a spare fridge so it is now fermenting. Muscato Giallo is normally a sweet dessert wine. Having you own vineyard definitely has its perks! Wow! Looks like such fun at the same time while doing some awesome farming! Bravo on your bumper crop of grapes. I have always wanted to make my own wine but haven’t attempted it yet. It’s on the list. I do enjoy it and visit wineries, admiring all their accomplishments and productions. Oh, and sample the divine wines as well. Thanks for sharing this. I love seeing the back side of someone’s passion. And hobby? That is some hobby!